Just like fashions in sunglasses, automobiles and handbags, there are definite trends in desserts. The first dessert era I remember was age of tiramisu, followed by the crème brûlée epoque. Next came chocolate lava cakes, which oozed their way onto dessert menus everywhere and took their sweet time leaving. The latter half of the 2000s has been the Era of the Cupcake, when the homemade treat made by moms everywhere was re-imagined as a designer sweet with a 3-inch beehive of frosting and a $3 price tag. As a dessert trend, I think cupcakes are pretty 2008 (read over), but creative homemade cupcakes will never go out of style. I like borrowing some inspiration from designer cupcakes and adding them to the homemade ones. I remember being fascinated with Ring Pops as a kid and wanted to find a way to incorporate them in a girly cupcake. I baked white cupcakes in fluted petal baking cups and then frosted them with a lemon glaze. Then while they were still soft, I embedded the shank of a ring pop in each one and finished with a sprinkle of silver and white sugar pearls, plus pink and green sugar sprinkles to match the cups. I have to admit, the cupcake making part was super-easy, as I used boxed cake mix and frosting mix from Trader Joe’s. I turned their white frosting into lemon glaze by substituting the juice of two lemons for the hot water called for on the box. 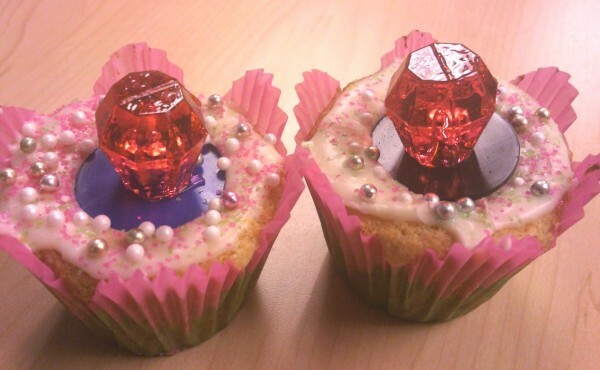 These Bling Ring Cupcakes are a bit over the top, but they’d be perfect for a tea or a princess party. And when I took them to work, they were appreciated by girls of all ages.